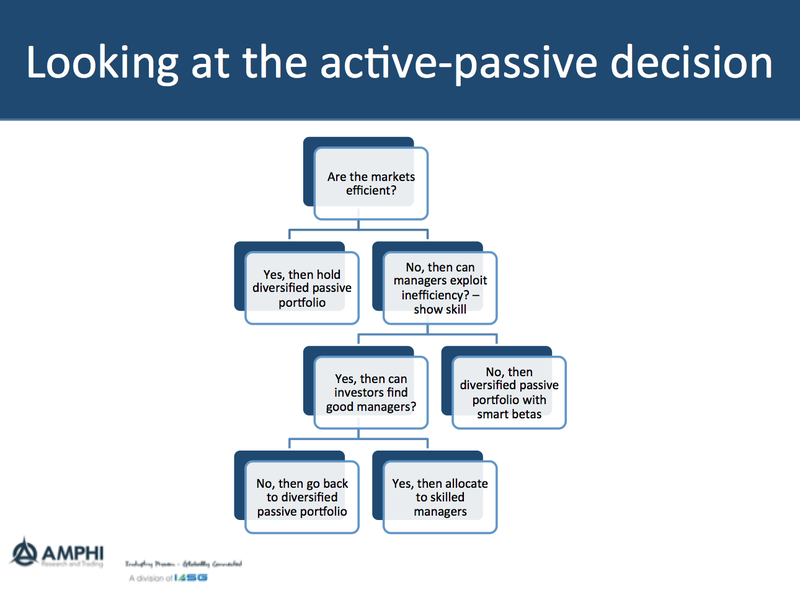 The choice between active and passive investing has been a battle that has been raging for years, but it can be simplified through a set of easy questions. The answers to these questions are not all together easy, but by forming a direct set of clear questions with a decision tree, the issues can be discussed out in the open. The first question is about market structure and efficiency. If the answer is yes, markets are efficient, then the choice is simple. Invest with passive indices and hold a diversified portfolio. There can be a wide range of answers to the question of what is an appropriate portfolio, but the question of choosing active managers should be off the table. Surprisingly, the market has moved more to passive investing at the same time as more agree that markets are not efficient. If the answer is no, then the investor has to moved to a second question. 2. Are there managers who can exploit market inefficiencies? That is, are there managers with skill? Markets can be inefficient but that does not mean that all active managers trying to exploit these inefficiencies have skill. There can still be only a small number who actually have the skill of being able to exploit inefficiencies. If the answer to the question is no, then there could be room for specific strategy benchmarks or smart beta alternatives that may be able to exploit some inefficiencies. The spectrum of strategies could include rules-based portfolio that exploits inefficiencies through benchmark at relatively low cost. 3. If there are managers with skill, then the next question is whether the investor can identify the skilled managers or forecast the managers who have skill. This is not easy because differentiating between those managers with and without skill may take a lot of data and there may be switching between skill managers based on the environment or the strategies that are successful. A manager could be a skilled at value investing but not able to make significant gains during a period when value is out of favor. If an investor does not have the ability to identifying the manager with skill, then he should move back to the passive diversified portfolio. The conclusion is that any holding of active managers has to be based on the market environment, the quality of managers, and the ability of investors to identify an inefficient environment and skill managers. Since the markets are generally efficient, good managers are rare, and it is hard to find those managers, active management should be an exception not the norm. Investors are often blending managers to find the right return to risk trade-off. The portfolio structuring is often simple. The correlation across managers is analyzed on a quantitative basis and descriptions of styles are used for qualitative analysis. This may work but often leaves a lot on the table for finding a mix that will be effective in the future. Another approach which moves to a deeper level is to mix risk factors. Using a simple approach of looking at blending asset class factors, an investors can breakdown the performance of a CTA into asset class betas; an equity, fixed income, commodity and currency market risk. The blending managers can be run through a simple beta analysis to find managers that either enhance of neutralize the beta exposures of any individual managers. Of course, this approach does not count for the dynamic nature of market betas for a manager across time, but it can serve as a simple check on what risks are being taken with a portfolio of managers. In the above case, we have broken down the performance of two managers using monthly data over the last three years. We are simplifying the discussion and not including the standard errors on the betas. In the case of CTA #1, we are looking at a longer-term multi-model systematic trend-following manager. Notice that the manager has a low beta to the stocks market but a song beta to long-bond. There is no sensitivity to commodities and a slightly positive beta to the dollar. This is a good diversifier, but an investor may want to further decrease the sensitivity to traditional assets. In the case of further diversification, we can add CTA #2 which has a short-term focus. Here there is no sensitivity to the equity market portfolio. The only positive relationship is with bonds but it is lower than the exposure seen with CTA #1. CTA #2 also has a positive alpha component. 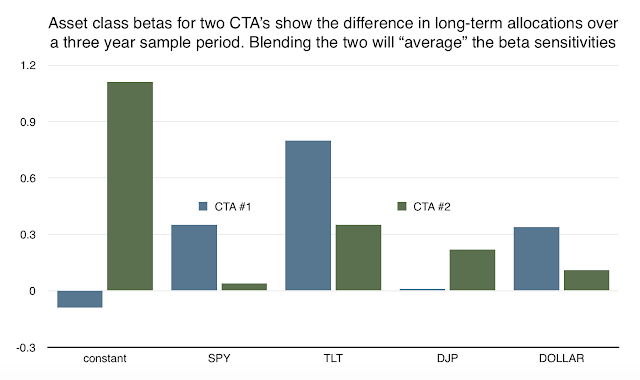 Adding CTA #2 to the first manager will be able to neutralize some of the beta exposures to traditional asset classes. This work could be seen through simple correlation but the added step of looking at betas will further refine what is happening to a portfolio mix. This added step is very easy to add and allows for a deeper understanding of potential risks. The process of scientific discovery even within finance is important. One approach to finding new strategies could be to generate observations and then provide explanations, an inductive approach. The other is to first form a theory and then test a hypothesis, a deductive reasoning. Much of machine and statistical learning is inductive reasoning where data are used to suggest general hypotheses. Deductive reasoning is used with experts systems where rules are made and then tested against the data. The surge in data analysis is based on a belief that inductive analysis will be able to identify new relationships that may not have been previously hypothesized. The danger comes when the analysis is atheoretical. This has been given a name, HARKing (hypothesizing after the results are known). There also is mining of data for anomalies or risk premium that may not exist. Data can be tortured until it generated some level of significance, "p-hacking". A relationship is found, but only after the fact is it given an explanation. From data come stories not the testing of ideas. Call it meaning without structure. Now, we don't want to put all of these techniques on a trash heap to be ignored, but there is important room for experts and practitioners to guide and interpret what the data mines are producing. If data suggests a relationship but there is not an easy story to tell, the relationship should be suspect. Good modeling and data analysis tries to test hypotheses and stories and has an idea of what could be possibly found in the data. 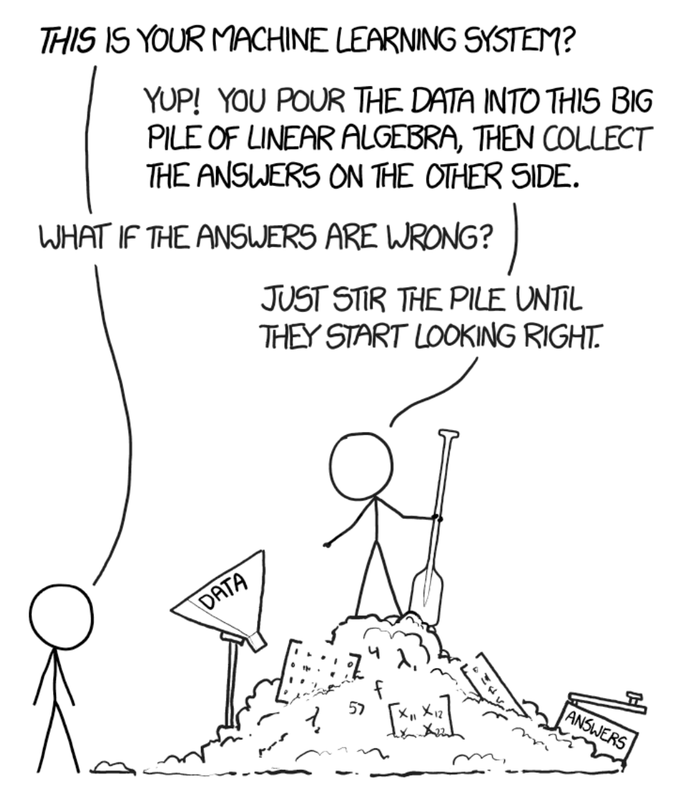 Can there be new surprises in data? Of course, but those should be the exception no the rule with machine learning. Investors are so used to looking at standard deviation to define risk that they forget some easy exploratory data analysis tools that can be very helpful. The boxplot focuses on a greater description of the data through a simple display of a brand array of information. The box is formed by the first and third quartiles, the whiskers are 1.5 times the interquartile range, the green diamond is the average, and the black boxes are the outliers. We have looked at the last three years of monthly data and can make some simple observations. This list can be much larger. First, most asset classes are subject to some outliers and there is a lot of movement going on outside the box. Second, risks can vary greatly across asset classes even between US and international stocks. Third, there are significant differences in fixed income risks. The diversified lower duration Barclays Aggregate index is much less risky than holding the long bond. 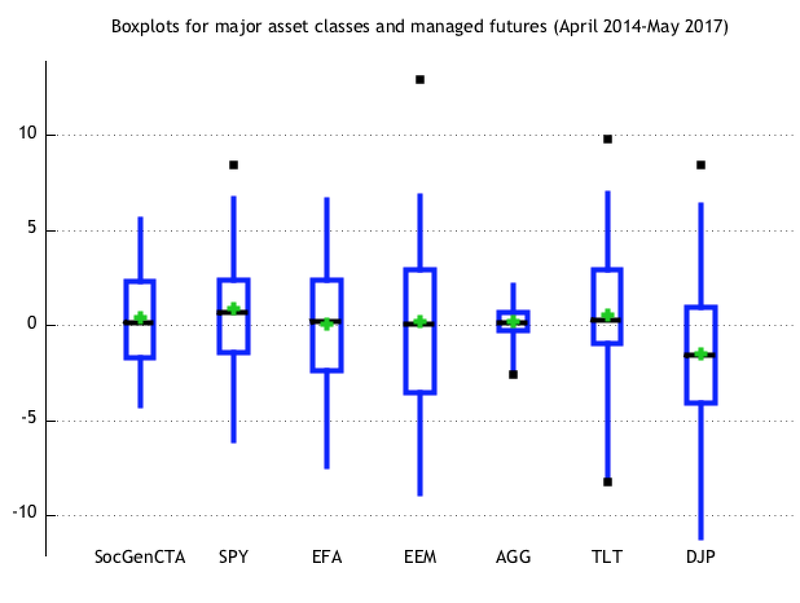 Finally, a portfolio of managed futures as a representative alternative asset class shows a much tighter distribution of returns. Portfolio risks may be more concentrated in the traditional assets. We are not making a case for managed futures, but rather highlight the richness of data that can be gleaned through simple tools beyond standard deviation. This follows the old adage - before you model it, plot it. If you don't have a feel for the data, it will never talk to you or guide you. There has been a preference for large managers within the managed futures space as measured by money flows, but it comes at a cost. 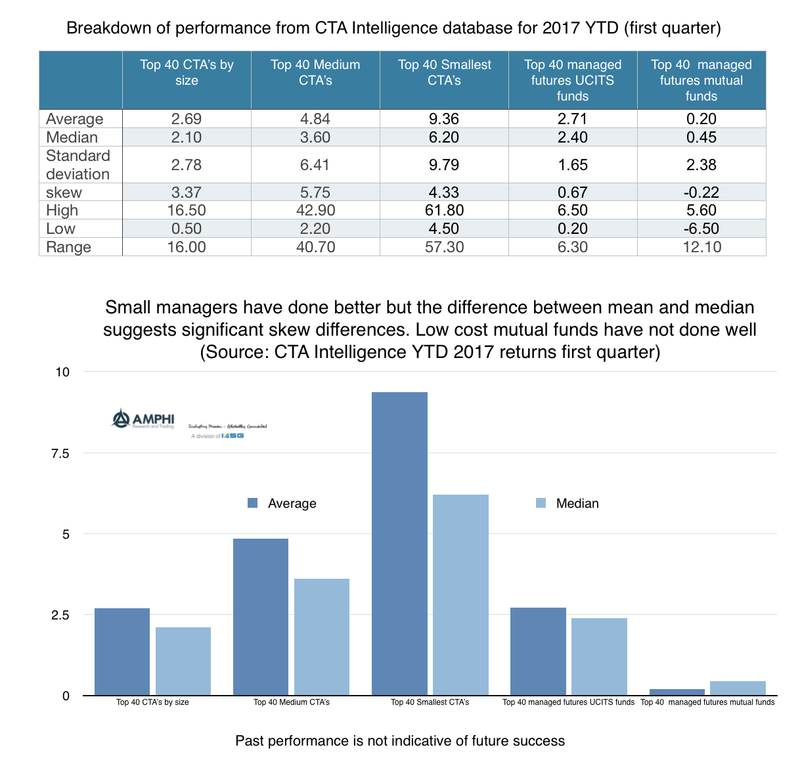 Looking at year to date performance from the CTA Intelligence performance database shows the differences in performance based on size. What is clear is that the average performance of a set of 40 small managers is significantly higher than the performance of the largest 40 managers. Going down in size will allow clear increases in average return and with median returns; however, a closer look shows that the price of obtaining higher returns can be high in terms of regret. The standard deviation as one measure of performance spread shows that as you move down in size the range of performance gets drastically larger. One standard deviation on the downside will wipe out the average return for all categories. However, performance does not seem to be normally distributed. There is skew to the upside. More importantly, the range between the high and low manager within a category is multiples larger than the average. While many may look at managed futures benchmarks, those returns are not usually representative of what you may get from choosing any one manager. There can be large discrepancies between an equally weighted portfolio and an individual manager. This is the price or cost of due diligence. If the wrong manager is picked, there can large downside costs. If right, the gain can also be high. Even in one quarter, a bad pick can be multiples away from the average. The advantage of buying a large manager is with the clustering effect with performance. The cost of being wrong is minimized. So investors who pick from the large managers may not asking for something better but something that is less likely to be out of step with the rest of the group. Call it safety-first and performance second. Going down is size allows for better due diligence to be rewarded. It is a trade-off. 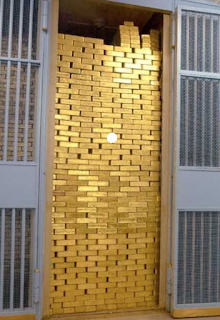 With a new regulatory environment, the traditional gold market is up for grabs. 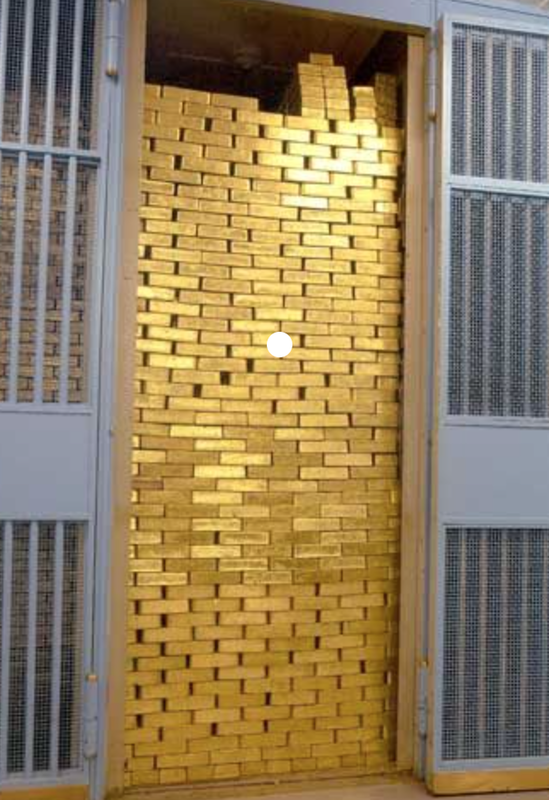 While many of the changes have not been direct to the gold market but based on a broader environment, regulation is changing the market structure for trading in gold. Regulations which increase the cost of trading over-the-counter has and will push gold trading onto exchanges, centralized counterparts (CCP's). This environmental change is the opportunity for new exchange entrants in the gold market. We have already seen new trading through ETF's over the last few years change gold dynamics and now there is the opportunity for changes in futures trading. For many hedge funds and managed futures traders, the main point of access for trading is the futures exchange; in this case, the COMEX exchange of the CME. However, the LME wants to become a rival through new gold futures contracts. The question becomes whether the move to exchange trading gold around the globe will allow for another exchange to take advantage of the opportunity and co-exist with the CME and take market share. History has shown that there are few cases of successful entry into the futures markets relative to an established marketplace. 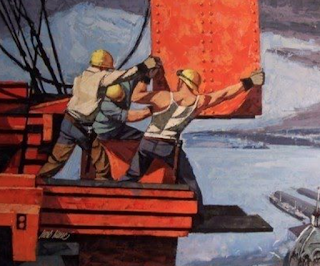 Regardless of the regulatory environment, it is hard for new exchanges to break the network economies created from a successful trading forum. There has to be something different to attract traders. What makes this time different is the changes in regulation that will increase the costs for major banks to trade gold OTC. With higher risk weights, credit valuation adjustments, higher margin requirements for non-CCP trades and for longer margin period of risk (MPOR), exemption of leverage ratios for CCP trades, standardization, and best execution standards all affecting OTC trading, there will be movement to exchanges. The issue is how much, how quickly, and where. The COMEX/CME has served many participants well but is a standardization model different than what has been used by the LME. The LME would like to threat the needle and provide something that has the concentrated liquidity of the COMEX and the features well-known to LME industry users. Hence, the "hybrid" approach of LMEprecious will allow for more flexible trading. With daily dates tradable from T+1 to T+25 and third Wednesday monthly prompts for 24 months and another 12 quarterly dates, the LME contracts will provide more flexibility than the COMEX. The question is whether costs can be reduced enough to facilitate the switch from the OTC market. This will be a battle worth watching. Why is managed futures or more precisely trend-following an effective investment strategy? Many managed futures programs have been successful by keeping it simple and using heuristics like following the price trend and not always using all the information that is available about a market. Disciplined and systematic decision-making seems to be a robust means of dealing with a complex world. Managed futures programs do not work all of the time, but there has been consistently strong performance during times of stress, crisis, and uncertainty. There has been an ongoing problem of explaining why systematic trend-following can be an effective strategy. Rules of thumb may be subject to biases and may be sub-optimal relative to more complex approaches to return generation. 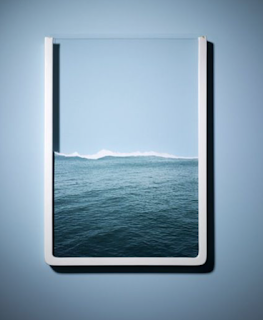 The foundation for the strong systematic managed futures performance is based on the ability of managers to quickly generate better decisions in the uncertain environment often faced by investors. Trend-following can be thought of as a form of simplified decision-making first described by Herbert Simon as "satisficing" or bounded rationality. More recently, this bounded rationality has been called or described as "fast and frugal" decision-making as popularized by Gerd Gigerenzer. Decision theory and empirical research has taken two different directions on how to describe the behavior of decision-makers. One school can be called the heuristics and biases approach to decisions which has been the field of study for Nobel Prize winner Daniel Kahneman. Gary Klein founded the other decision behavior school through his natural decision-making approach. Natural or adaptive decision-making celebrates rules of thumb gained through experience surrounding the environment. Both offer different perspectives to the often “fast and frugal” approach used by trend-follower and provide insights on why trend-followers can make money when perhaps others have difficulty. Both approaches can help describe managed futures decision-making and why it can be effective especially during times of crisis. A more uncertain environment requires faster decision-making that is based on simple rules. When time is critical, information limited, and the environment uncertain, following price trends can be more effective than any full optimization of all data. 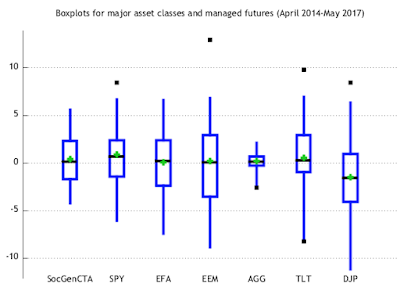 We think that managed futures are the intersection of these two schools for explaining decision-maker behavior. Daniel Kahneman has popularized the view that many decisions are based on heuristics or shorthand rules for fast decision-making; however, he has also been at the forefront of documenting all of the problems associated with biases from fast decision-making. We switch between fast and slow decision-making or from thoughtful thorough analysis and quick decisions that have to use limited inputs to draw conclusions. The big decision problem is knowing when to switch between fast and slow decision-making and how to avoid using the wrong tools at the wrong time. If we use deep analysis for all our decisions, we will be paralyzed with inaction. If we use heuristics for making snap judgments we will surely fail when deeper thinking is necessary. For Kahneman, systematic managed futures managers have to balance between simple fast tools against deeper analysis. Gary Klein has studied expert decision-makers for decades and has formulated the view that experts are able to make good quick decisions because they are able to properly contextualize the problems they face to find cues that will help with decision-making. 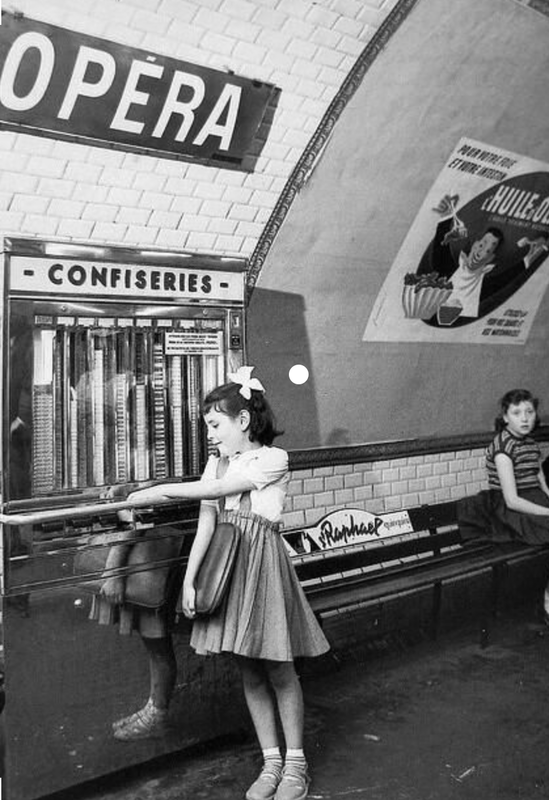 Expertise comes in the form of recognizing patterns from repeated play. Intuition is a function of identifying cues based on the environment faced by the decision-maker. 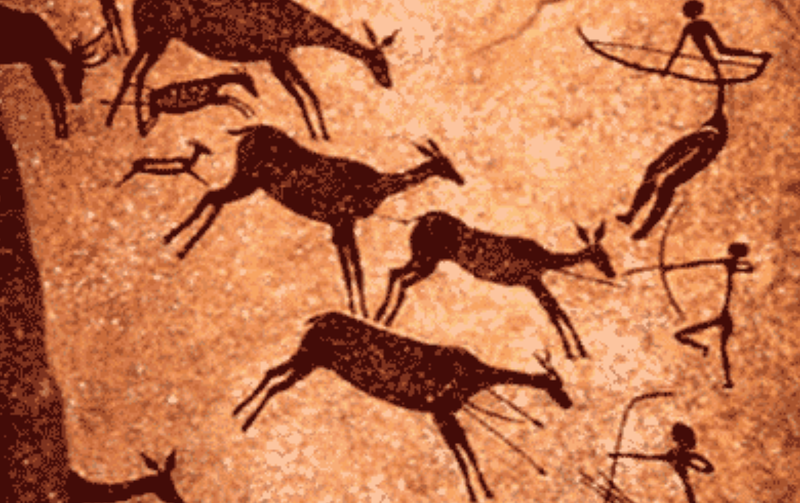 In a fast paced market where there may be limited new information, prices are primal. The best way to deal with decisions is to exploit the patterns or trends that are readily available. There could be biases from using a satisfying approach, but it may be the best approach in a complex world. Some have view Kahneman and Klein are in conflict with one focusing on biases while the other focuses on expert judgment through cues and heuristics. 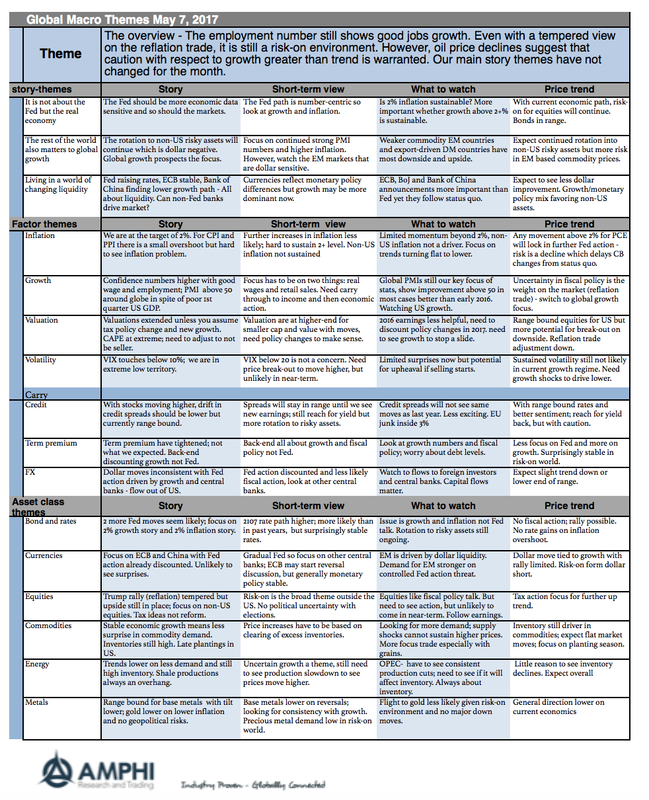 In reality, managed futures managers implicitly take the best from each to form their strategy framework. From Kahneman, managed futures has a deep awareness for potential biases and uses rules to control risk and offset the natural tendency to sell winners and hold losers. 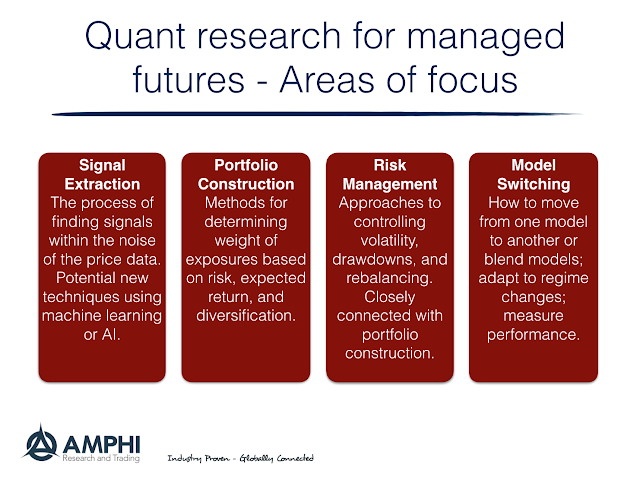 From Klein, we see managed futures managers can be good natural decision-makers by using the patterns that are apparent in price activity. Trends happen and rules can be developed to exploit them. In a complex world, managed futures have been able to develop rules for offsetting biases and rules for finding repeatable events. Increases in technology have allowed for more complexity and better decision-making but the game is still the same. Computers and models are used to look at more markets to find fast and frugal decision rules to effectively exploit opportunities and manage risk. This can be in the form of simple and adaptable rules in order to make quick judgments in fast changing markets. The Funded Status Volatility index (PSRX) from NISA is a useful tool for understanding pension risk exposures. It is an aggregate of the risks for pension based on the combination of assets and liabilities associated average allocations for the 100 largest pension funds as measured through public information and 10-k filings. The index, which represents $1 trillion in AUM, will move up and down with the volatility of all asset classes. Hence, falling equity and bond volatility as well as changes in the discount rates will translate into a falling PSRX index. Still, the starkness of the volatility decline in the index is telling. There is less risk with the funding status of pensions but this also means there is less upside potential. The risk of seeing a large change in your poor funding status is about 50% lower than what it was 10 years ago. For the underfunded, pension problems will not go away. Those in good financial shape can sleep well at night. Yet, if we move back to the good old days of 10 years ago, there will be a lot of pension risk. This low volatility environment has generated a search for holy grail investments - good returns with the ability to provide diversification. If volatility is headed higher, pension will want something that can dampen risk. If volatility stays low, pension will want some absolute returns to help get out of their underfunded status. Find me unique managers who can make money! Where are these managers? They have to be iconoclasts who will take risks and not be like everyone else. Unfortunately finding these managers is not easy. To offer diversification and return, these managers may have higher stand alone volatility, larger active shares versus a benchmark or peers, and a willingness to be nimble in the face of changes in risks and economic cycles. A safe manager which has appeal to the masses is not needed. Yet, with fewer hedge fund start-ups, growing consolidation, and a focus on asset gathering by many successful managers, investment risk-taking is less likely. 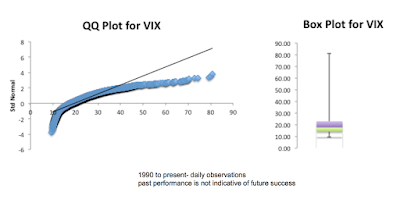 Volatility and managed futures - Is there are relationship with the VIX? Many believe that managed futures is a long volatility strategy because the strategy is like being long a look-back straddle. We believe there is a more nuanced story associated with long gamma exposure, but let's use the prevailing wisdom of long volatility as a starting point for a discussion. The question related to the current environment is simple. Should you buy managed futures because volatility is low? Since volatility is low, this could be a good time to buy a "long straddle" strategy. The relationship between low volatility and managed futures can also be viewed through thinking in terms of valuation. 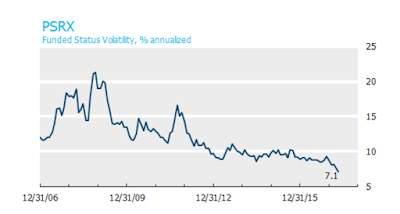 Does low volatility means that managed futures funds are cheap? 2017 inflows suggest that even though recent performance has been negative and many large trend-followers are in drawdowns, investors are putting more money into the space based on a expectation of higher volatility. So is there evidence on the the connection between volatility and managed futures? We have looked at this issue in earlier posts, Managed futures and VIX - beware high daily volatility - embrace high monthly volatility and Managed futures and volatility - The type of vol matters. Our conclusion is that there is no simple answer and there is such a thing as good and bad volatility. Higher long-term volatility which increases the spread of prices is a good for managed futures, but spikes in short-term volatility is detrimental. At tight or range-bound spreads as measured by vol, there may be limited opportunities. If volatility increases and thus increases the range in prices, trend-following should be more profitable. Nevertheless less, volatility spikes may cause positions to be unnecessarily stopped and thus less profitable. There has also been some extensive research in this area which suggests that there is a connection between volatility moves and managed futures, but it is also complex and suggests that the trading time frame of the manager matters. 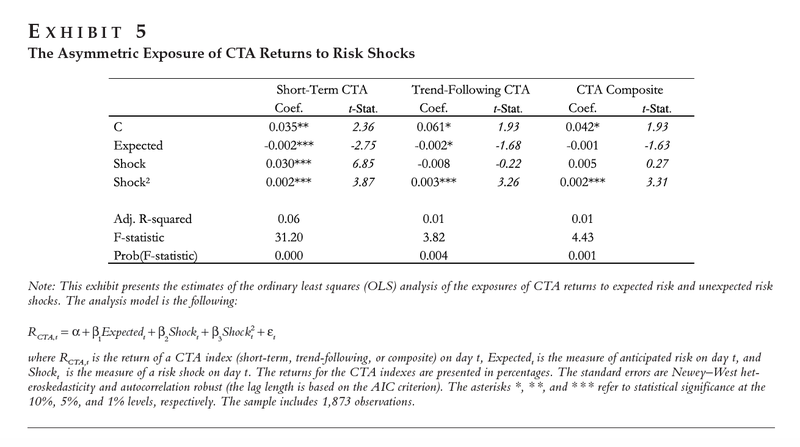 This useful analysis was done by Christian Lundstrom and Jarkko Peltomaki in their paper, "Beyond Trends: The Reconcilability of Short-term CTA Strategies with Risk Shocks" in the winter 2015 Journal of Alternative Investments. At a simple level, the researchers found that the VIX level leads to different performance across managed futures styles. They also found that managed futures performance will be impacted by whether volatility changes were expected or unanticipated. 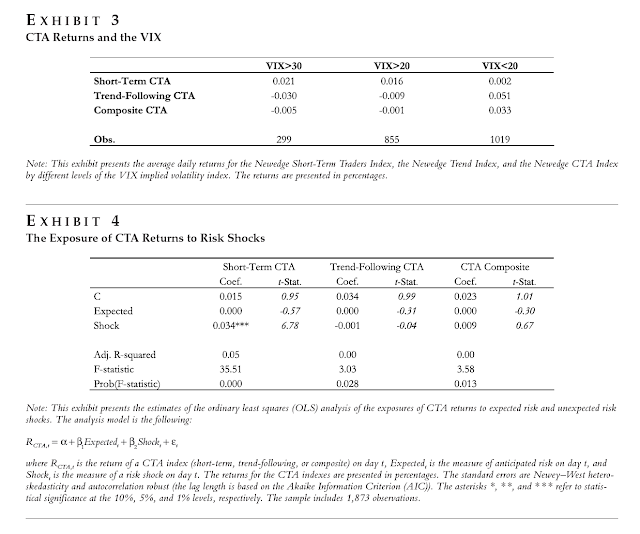 Exhibit 3 shows that managed futures returns are sensitive to the level of VIX. Short-term traders will do better when the volatility is high and trend-followers actually do better when volatility is low. There is a return difference in performance based on the timeframe of the styles used. Exhibit 4 shows that short-term traders do better when there is a volatility shock. Short-term traders will exploit short-term changes in volatility. A deeper analysis suggests that short-term CTA's will generate positive returns for volatility shocks and the impact is non-linear. 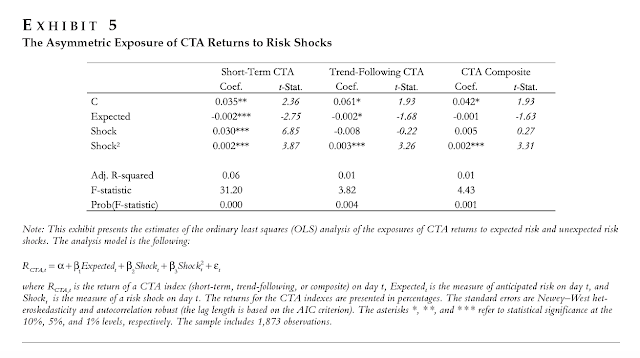 The linear response to shocks is not present for trend-following CTA's although they also have positive non-linear response to shocks. The return response to expected volatility is slightly negative. 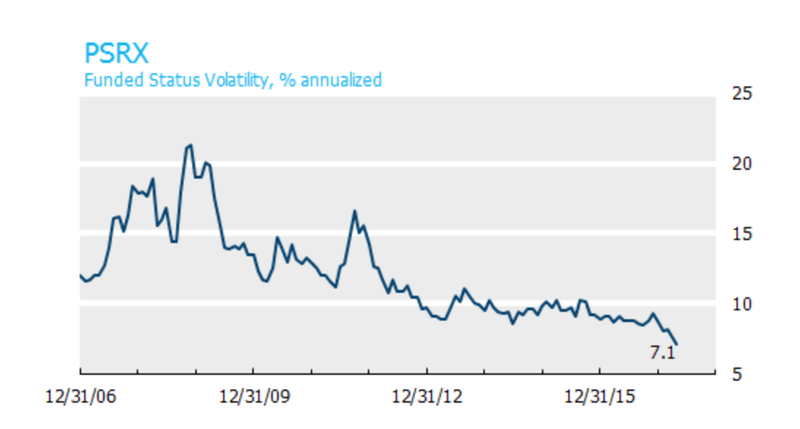 The response to volatility shocks differs with the level of volatility. There will be more positive returns to shocks when overall volatility is higher. There is either an insignificant or a negative response to volatility shocks when volatility is low. 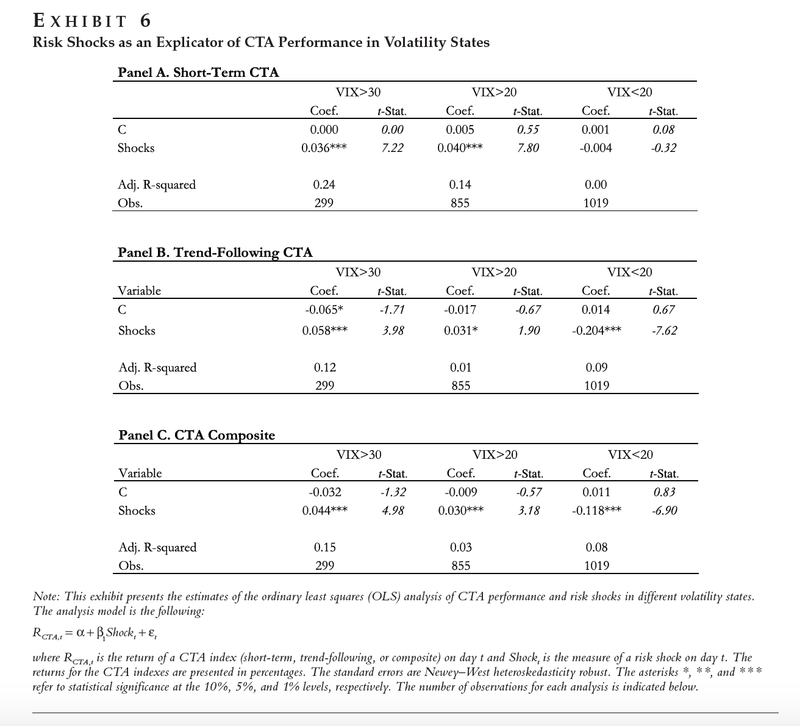 My reaction to this work is that the behavior of CTA's to expected and unexpected volatility is not completely consistent with descriptions of managed futures strategies and requires more research. The idea that managed futures is a long volatility strategy is not completely validated with respect to the VIX index. Of course, managed futures trade many markets and a single volatility index will not capture the behavior of these other asset sectors. Clearly, the trading time frame has to be matched with the time frame for volatility to get a better representation of style behavior to volatility. Nevertheless, if an investor wants to gain some protection or diversify against equity volatility shocks, he should hold an allocation to short-term CTA managers. How many managers should you review before you pick one? Choices, choices, choices. There are just so many managers to choose for a portfolio. Look at the major database, and you will find hundreds of managers of all sizes, styles and skill. Using some simple criteria, the list can be reduced significantly. Minimum size, minimum track record, max drawdown, and max volatility could be just a few ways of reducing the pool of managers, yet there could still be a sizable number of managers. So how many managers do you have to look at before you find the right one? This a classic decision science problem given a specific name, "The Marriage Problem" and more recently "The Secretary Problem". The lay-out of the problem is simple. How many candidates for marriage or a job should you review before you make a decision? This is assuming that once you make a decision the game stops and you cannot go back. If you look at all candidates and have not made a decision, you will have to take the last one. You offer or go on with the process. Martin Gardner solved the problem in a 1960 Scientific American article. For an in-depth review on the math see, "Who Solved the Secretary Problem?" and the rejoinder. A simple algorithm based on optimal stopping times has been developed which states that 36.8% of the total sample of choices should be reviewed before a decision is made. So if you take a large sample and reduce the number based on some simple criteria, you may still be left with 10 candidates. The question is how many should you interview before you make a final decision. The answer is 36.8% (4 out of 10) of the sample or 1/e should be reviewed. Then choose the first candidate that is better than the set reviewed earlier. Of course, if the best manager was in the initial 36.8% of the sample, you will be stuck with a second best solution. Nevertheless, you will end with a good choice if you follow this algorithm. Now this may seem far-fetched as an explicit way to choose managers within the hedge fund space, but like many fun math problems there is a kernel of useful information that can help with other more serious problems. 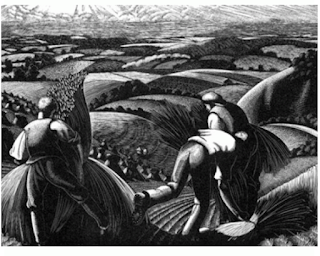 So what can be done for hedge fund managers selection and due diligence? 1. Use a filter mechanism to cut the number of managers to a smaller size based on set minimum standards. A simple filter could be size, length of track, and worst drawdown. 2. Set criteria for what you are looking for in the due diligence. 3. Set the number that can be initially interviewed. 4. Start reviewing managers to get a "feel for the sample" formed. 5. After reviewing the initial sample, pick the first manager that is better than the set reviewed. This is not perfect and can be subject to criticism, but it forms a simple algorithm that can start the process and lead a good outcome. I am open to other ideas, so let me know what you think. Managed futures research is hard. This is especially the case in the quantitative area. There always are new models being tested by almost all managers, but finding a truly new model or process that adds value is truly difficult. 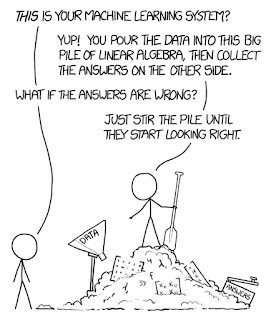 Data mining is an issue. Managers gain new data everyday but most of the test data has existed for years. This past data are not changing and has been mined extensively. Many of the techniques used to extract signals are well known. The objective functions or goals for most programs and investors are well known. Most managers want to achieve a return to risk above one net of fees. The risks that have to be controlled are also well known. Most managers think that volatility should be set at a target and drawdowns have to be minimized and should be below a well-defined threshold. So it is not easy to find something new that is not subject to data-mine issues and meet these constraints. Consequently, it is important to determine where research could or should be conducted and handicap the chance for something new. While we see there are significant areas for further research, each areas of research may produce different levels of benefit. To start a discussion, here are some simple thoughts on where research will be fruitful. Signal extraction - The process of finding improved signals has strong potential using some new techniques like machine learning and AI; however, there are significant barriers to entry based on the knowledge of how to program and developed these models. Unfortunately, we have seen the use of AI models in the past only to be disappointed with the results. New price-based models using older techniques may be limited. There can be some strong gains from the use of fundamental models; however, these models may be subject to issues of coefficient stability. 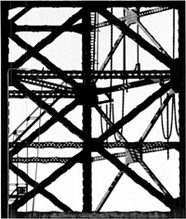 Portfolio construction - Employment of new portfolio construction techniques may be limited, but there can be many new ways to form weighting schemes based on the preferences of managers. This can be a fruitful area of research but is closely related to the utility and risk averse of the manager and not the type of model used. Risk management - After the strong movement to VaR and risk-weighting schemes over the last few years, there may be limited room for improvements except for the adjustments based on a deeper focus on differences in the distribution (skew and kurtosis). All of these areas require a fair amount of theory and data research work in order to generate significant results. In fact, our point is that anyone should be wary of a new algorithm or a new approach. Most of what passes for new may be the preference choice of the manager and not a new technique. There is nothing wrong with making models, risk management, or portfolio construction preference choices which may lead to better returns, but that is not the same as a new method of finding value. 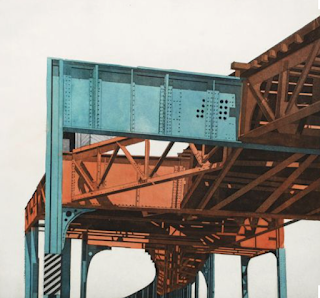 Perhaps a key research area is focusing on how decisions are made and systematized. The Fed and other central banks are not that important in the current thinking of investors. The focus is not on the policy musings of bankers but the real economic data. All that matters is whether growth has a strong chance to be above trend and whether global DM inflation has a chance of reaching and sustaining 2%. We are skeptics of both occurring. A strong growth trend will allow the current risk-on environment to continue. Inflation moving higher will reinforce more conservative or hawkish central banker views. The euphoria toward the reflation trade is coming back to reality and is likely to move more closely to the real data. Growth may be stronger than last year but break-out trends in growth are unlikely even with strong PMI's signals. Bond investors have stayed cautious about this risk-on world and falling oil prices signal weaker demand. There is a disconnect between equity and bond market views of the world. We do not intend to fight the risk-on sentiment and side with the more conservative bond view, but any risk-on overweight is modest in the current environment. 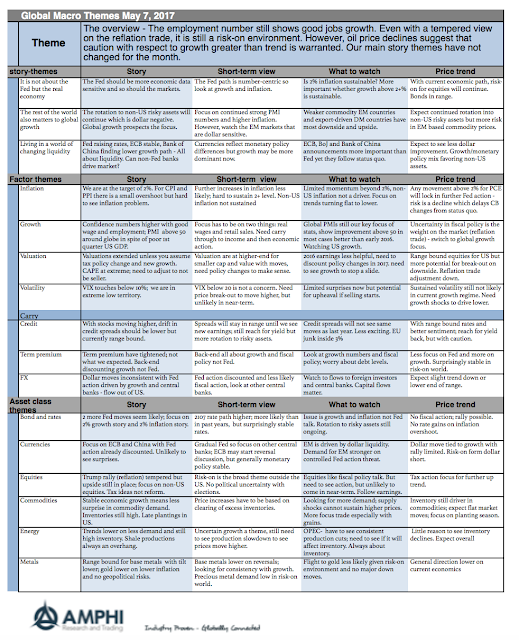 LME Discussion paper on market structure - what do investors want? There does not have to be a long discussion on what investors want from a metals exchange or futures contract. Liquidity, liquidity, and liquidity. We use the word three times for each of the liquidity forms that attract trading. It does not matter if you are a hedger or speculator, the demand is the same; deep liquidity so the cost of transacting is low. Liquidity from by tight bid-ask spreads. Liquidity from low transaction, hedging, and processing costs. Liquidity from deep markets that will not move when size is entered. Liquidity just does not appear. It is a function of the structure surrounding the market. The rules of the game matter if you want to create liquidity, so the new discussion paper from the LME is provocative approach to open a discussion on market structure (LME Discussion Paper on Market Structure - April 2017). The paper is a description and justification of the current LME environment, but also a call for help from investors to ask what they may need for a better market structure. This paper may be the best description of the current LME structure, but it also clearly shows how it is out of step with other futures markets. The recent sale of the exchange for over $2 billion suggests that the buyers are looking for a return on their investment. They want to provide an exchange service, but they also want to make a profit. When we talk about liquidity in context of three types, we are discussing three levels of costs. The bid-ask spread is the immediate cost of transacting in the market. There are also a set of costs which effect any transaction. We call this the structural costs. Finally, there is the implicit cost associated with deviations from fair value. Of these three costs, the structural costs associated with market mechanics is what can be controlled by an exchange. If the cost of trading on an exchange is minimized, the result will be deeper markets with lower bid-ask spreads. So what impacts the trading structure? For an exchange, we can explicitly focus on a few areas. 1. The contracts that are offered, the terms and conditions. For most exchange markets there are a limited number of futures contract expirations. The LME is different from other exchanges with how they offer contracts. The focus is on the hedger/producer and their business needs not the speculator who would like a more focused set of market contracts. The disperse set of LME contract expirations may limit liquidity. A three-month contract offered every week creates less liquidity if you try and sell before expiration. 2. The margin system. Again, given the focus on producers, the system of margin payments are different with present valuing back to cash price and not the daily market to market process found in most other futures contracts. This has an impact on the actual cash outlay and the cost of trading at the LME, making it more expensive to be a short-term trader. 3. The actual prices charged for using the exchange. The cost of trading the LME is higher than other futures contracts. The drivers of market structure have been the ease for commercial users who price against the LME and not speculative account who can increase volume, The current contracts specs reduce the potential basis risk and allows for more direct hedging at the expense of volume. A move to more "standard" futures may help with speculative activity, but may harm hedger opportunities. It is a balancing act for any exchange but the LME wants to touch this issue directly through the engagement of all traders. This is an interesting experiment. We wish them well. 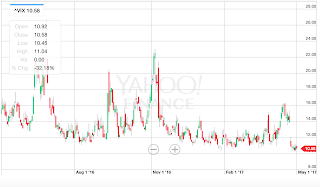 The VIX index, the most widely watched measure of market volatility, is at extended lows with a jump lower after the French presidential first round election results. The uncertainty and risk premium from this election has been taken out of the market. 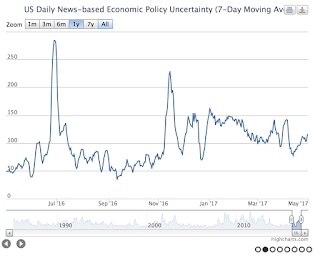 Economic uncertainty has also fallen since the US election although it is still elevated since the earlier last fall. Is volatility a thing of the past? Well, it seems that way. We looked at close to 7000 daily quotes on the VIX since 1990 and found that current volatility is at the 1.45 percentile. It is low. These low values do not last, but any strategy that needs a spread in the distribution will not do well during these periods. 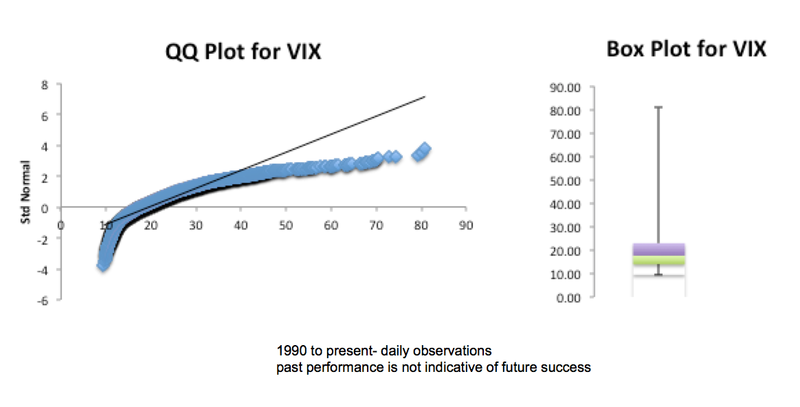 It should be noted from the QQ plot and the box plot that the distribution of volatility is far from normal. So even though volatility is low, the weight of the distribution is skewed to values below 20. This is not a normal distribution but one with significant positive skew. 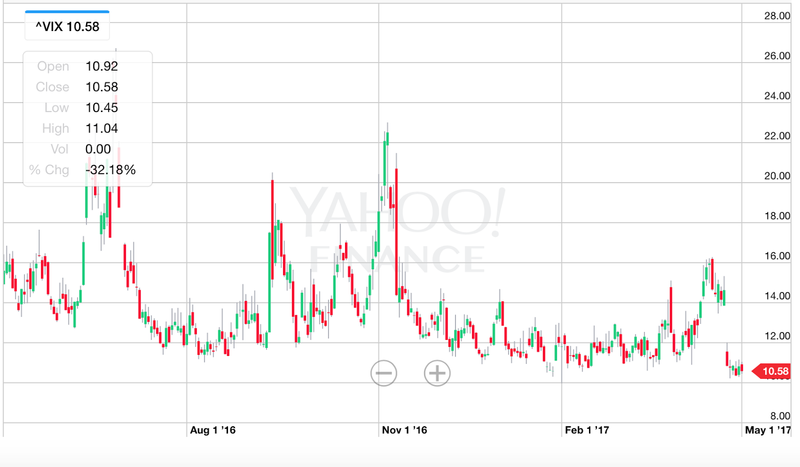 The question in not whether the VIX will change, but rather how long will the low volatility persist. 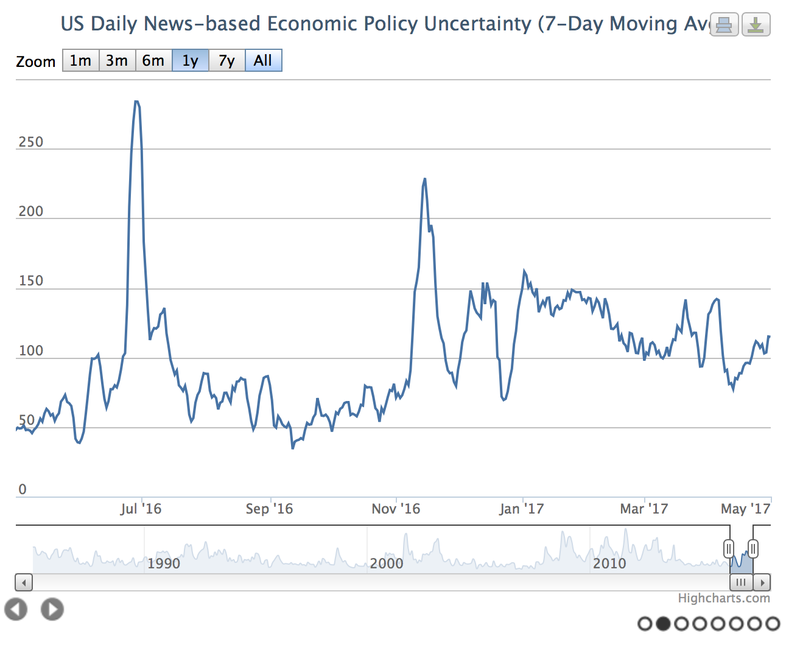 The policy uncertainty index has fallen since the Brexit and election highs over the last year, but it is not at significant lows. The latest GDP numbers for the first quarter are lower than expected. Lower end economic performance usually is associated with higher volatility. Given the distribution of VIX prices, a comparison of toady's level versus the level in a month or two would not be helpful. Mean reversion will occur; nevertheless, the extent of the move may be limited given the clustering of low VIX values. There is a 32% chance of the VIX being below 15; a 50% chance below 18; and a 62% chance below 20. The big move event is not likely if you are playing the odds. The numbers shows that upside jumps in the VIX are more likely than downside spikes. There is nothing usual with this behavior, but over any twenty day periods, there is only a 5% chance of jumping by more than 7 vol points and only a 4.75% chance of seeing a 40% or better up move over any 20-day period. Anyone expecting a big vol jump on mean reversion will be disappointed. This would still mean a vol that is less than 20 in the next month even if we had a significant spike. We are not saying to accept low vol as a part of everyday life, but a return to anything like behavior during the Financial Crisis is unlikely. 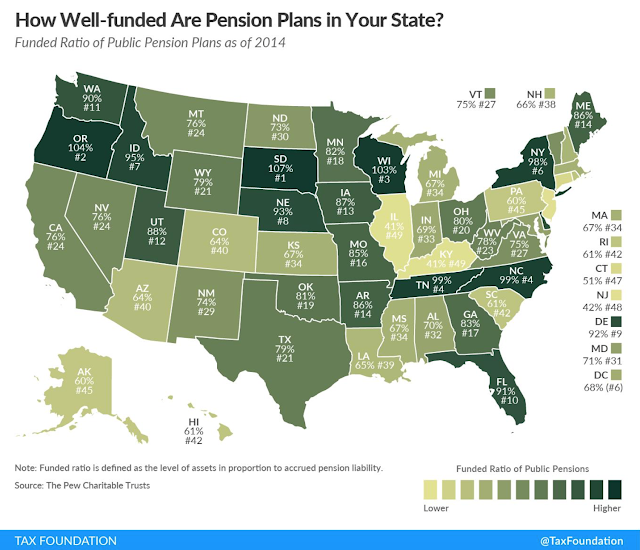 The Tax Foundation map of state funding ratios for public pensions is very sobering. The amount of state under-funding is significant. These numbers are determined by the discounted expected liabilities relative to the assets held. To stay even with these ratios and assuming there is no surprise increase in liabilities, the states have to return the discount rate. These discount rates or expected returns seem unrealistically high. A lower rate of return and the under-funding will get worse. If returns are higher, the gap will be closed, but a reasonable excess return of say two percent will still require years of good performance to eliminate the gap. What is critical for the states is ensuring that downside risk is minimized given that any return shortfall will be needed to be offset with future higher returns in order to just get back to a prior funding ratio. In this sense, pensions do not need high returns with risk but more stable returns with lower downside. In simple terms, the underfunded pension should not go for broke in order to make up shortfalls. If a state believes that the discount rates are too high perhaps for political reasons and equity valuations cannot be sustained then investments that provide crisis offset or have the ability to do better in bad times should be held. This should happen even if the crisis offset strategies have returned less than equities over the last few years. The past may not repeat and there should be less premium received for assets that are uncorrelated with the market portfolio and can do better during market downturns.